Windows Phone 7 Series: It's a thing! And it looks pretty great, so far. Last month's announcement, though, left a lot of questions. Questions which are answered here, in Gizmodo's live updated coverage of Microsoft's MIX 2010 keynote. How exactly will multitasking work? What about those incredible cross platform game demos? Whither WinMo 6.x, and its devs? (And what's with this "Classic" and "Starter Edition" business?) What happens to the Zune? Will we see more hardware? What about the mysterious Chassis 3? Why are developers already worried? We've got at least an hour here, folks, so expect answers. Lots of answers. When we met Windows Phone 7 Series, it was all about taking a first look. But we really didn't get a great idea as to how the operating system works, underneath the Zune-like skin. Here's are the new OS and dev features Microsoft's announced today. • A Push Notification Service: Called the "Microsoft Notification Service," this sounds an awful lot like Apple's push notification system, which lends credence to the interpretation of Microsoft's talk about multitasking as meaning that it doesn't really exist, or that it's at least heavily managed. As you can see above, they pop up in a small tray at the top of the screen, rather than the obnoxious pop-up system that the iPhone uses. • A Microsoft Location Service: This is like a clearing house for location data, or "single point of reference to acquire location information." This is more of a developer tool than anything else, I think, but it suggest location service's being totally and easily accessible, and not just in terms of raw data. This is basically just Bing everywhere, in both user and developer terms. • No Mac Dev Support: And yeah, of course, there's no development on Mac. We didn't even get to to see the new Windows Phone Marketplace in action in February, but now Microsoft's pulled the curtain back. • It's Panoramic: It's going to look like the rest of Windows Phone 7, which is to say, it's going to be swipey and zoomy and all those things that made Windows Phone 7 interesting looking. You know, hubs within hubs within hubs within hubs. Hubs! • Buying options: It'll handle one-time credit card purchases, operator billing, and ad-supported apps. 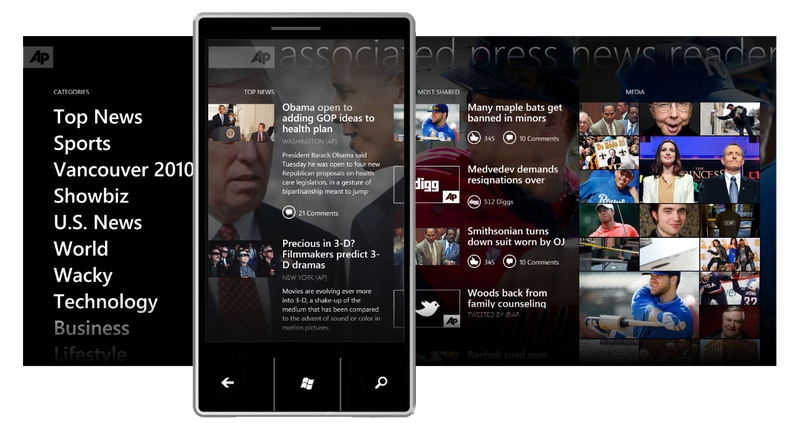 • App trials: Microsoft is going to require developers to allow buyers to trial apps before buying them. Good for us, potentially scary for devs. UPDATE: It's not actually a requirement, just an option. What this is, really, is an old-school app trial system: You use an app until your dev-defined trial is over, or until you get tired of the missing features, then you buy it, which instantly activates the remaining functionality, no extra download required. • The Zune Client: You can browse the Marketplace from the Zune client, like you can access the App Store from iTunes. This gives Windows Phone 7 a leg up over the likes of Android and webOS, which limit app installation to the handset. But! The Zune software is Windows-only. This doesn't just mean you won't be able to install apps from your desktop your phone on Windows Phone 7, it means that you won't be able to sync anything with your desktop, be it music, movies or photos. And there's no USB syncing outside of the Zune software client, so you can't just dump media onto your phone, mass storage style. In other words, if you don't have a PC, you can't really listen to your music or watch your videos on your WinPho 7 phone. &bull Copy and Paste: The current build doesn't have it, back at launch, word was that it might not ever show up on the platform. Now, Engadget's hearing the the final build may not be able to take text from here and put it there. This omission would be more curious, because there's really no upside, as in the case of limiting multitasking. Also: What the hell? Also also: They've got at least six months to fix this. • Only two resolution will be allowed: For the foreseeable future, Microsoft's only allowing two resolutions—the 800x480 WVGA resolution we've seen on the first hardware already, and later, a 480x320 HVGA resolution—for Windows Phone 7 handsets. Developers will only have to write for two screen sizes, which helps keep developing for the platform relatively simple. • Windows Mobile 6.x Apps Won't Work: Scott Guthrie confirmed to us that 6.x apps would need to be ported in order to work, and that this may not be a simple process—you could, for example, carry over some interface assets, or some core .NET programming from one platform to the other, but there'll be no simple patch from one platform to the other. Games, as we've seen a bit of before, have the potential to be great, not just because of the platform's minimum requirements (which make the iPhone's hardware seem downright clunky) but because of the deep Xbox Live integration. Joe Belfiore showed us a quick demo, in which he actually earned Xbox Live achievement points, er, live. The takeaway at the end of the app demos—which made up a tremendous chunk of this keynote—is that Microsoft knows how important apps are for Windows Phone 7, or more importantly, how instrumental the lack of decent apps was in the decline of Windows Mobile 6.x. They're going all out, claiming that devs can create apps in a matter of minutes, and (so far) coddling them as much as possible. The one thing they can't control, though, is how fast customers pick up on Windows Phone 7 Series. Without an audience, developers won't bother to write apps; without apps, buyers won't bother buying Windows Phone 7 Series phones. Microsoft's new mobile strategy may be impressive, but it could find itself stuck in a Catch-22 come release time. Obviously, Microsoft didn't run through all the stuff they'd already covered back at Mobile World Congress when Windows Phone 7 was announced, so here's the rest of the story. • A new piece of hardware showed its face today. (Above.) This time it's from Samsung. Externally, it's indistinguishable from the Omnia HD. Internally, you can assume it falls inline with Microsoft's minimum requirements for Windows Phone 7.